From I-4 Exit #90 onto FL-414/Maitland Blvd. Go West (right) 4 miles. Maitland Blvd becomes Toll Road 414, continue 2.8 miles. Take the 2nd exit after 414 begins, at the Keene Road exit (#6) Turn left onto Keene Road. At the first traffic signal, turn left onto Clarcona Road/Hwy 435 S. WELCOME! Lost Lake RV Resort is .7 miles on the right. We provide affordable, quiet, camping in natural surroundings. We are a family owned and operated park, allowing us the ability to ensure enduring relationships with our customers. Our business is located at 3400 S. Clarcona Rd, just minutes south of Apopka and a short drive to downtown Orlando. We're located near Florida’s premier tourist attractions, such as Disney World®, Universal Studios® and Sea World® and a short ride to downtown Orlando without the crowds and traffic. Use our KOA as your base for an exciting Florida vacation, or just sit back, relax and enjoy our pool! And if golf is your game, there are lots of quality courses nearby. Located just minutes from Walt Disney World®, this premier destination is perfect for campers in search of a wide variety of recreational activities. Situated among acres of pine and oak woods, the resort is small enough to be friendly, but big enough to provide all the amenities and activities your family could want. Whoa campers! Come and visit our friendly park offering 248 full hookup sites with 30/50 amp service, a swimming pool and large clean-cut sites with concrete patios and picnic tables. Conveniently located within minutes of Central Florida attractions, medical facilities, shopping and more. We offer a wide range of seasonal activities. Perfecting RV camping in Central Florida! We have all new electric with 50 amp service available at every site. New 9,000 sq. ft. clubhouse with heated outdoor pool and billiards room. Enjoy a canoe or kayak trip on the Wekiva River. Bring your bikes, sneakers, swimsuits and smiles! We encourage you to "Experience It All". 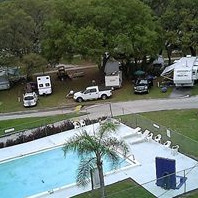 Clerbrook Golf & RV Resort can accommodate up to 40' RVs and offers full hookups with 50 amp service. Park features include three swimming pools and three spas, 18-hole golf course, beauty salon, pool tables and full-time activity director. Rentals available. Located 7 miles south of Florida Turnpike on Hwy. 27. Only 20 miles from Disney® and other major attractions. Peaceful 25-acre campground overlooking the scenic St. Johns River. Located 45 minutes from Disney® and 30 minutes from Daytona Beach. Offering clubhouse, activities, restaurant, country store, pontoon rentals, swimming pool, horseshoes, bocci ball, shuffleboard and poolroom. Clean restrooms and laundry. Concrete slabs and shaded sites. Located in the heart of sportsman's paradise near beautiful Lake Eustis. You’ll enjoy some of Florida’s best fishing and boating at Southern Palms. And with three spectacular clubhouses, two swimming pools, a whirlpool/spa, fitness center, card room, billiards, library, planned group activities and on-site events, there's something for everyone! In the heart of Florida’s orange grove country, this 255-acre campground is the ideal place to explore recreation and relaxation. Amenities include 2 heated pools, adult center, family center, game room, horseshoe pits, laundry facilities, mini-golf, nature trail, ping-pong, tennis, pickleball, ladder ball, duckpin bowling, playground, rowboats, shuffleboard, spa, swimming pool, and My RV Market.